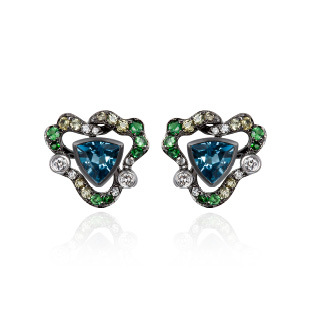 A pair of solid 18karat gold studs featuring custom trillion cut Swiss blue topaz, green garnet, yellow sapphire and diamond, finished with black rhodium. Inner studs can be worn separately on their own. Come away with me. Escape to a place where the salty air revives your soul. A place where water pounds rock and the two create the extraordinary. I took your breath away the first time you saw me and I still make your heart rejoice. Inspired by Sugarloaf Rock in the South West of WA, this collection is not just about the arresting beauty of WA, but also the spiritual experience of this sea sculptured rock that embodies perseverance, vision and passionate determination.